↑ Fitzherbert, Henry (2 January 2012). "Olivia Colman on the fast-track to becoming a national treasure". Daily Express. अभिगमन तिथि 22 March 2013. ↑ "Olivia Colman interview". The Daily Telegraph. London. 20 August 2012. अभिगमन तिथि 22 March 2013. ↑ "Olivia Colman: "I immediately knew I would marry him"". Big Issue. अभिगमन तिथि 12 December 2015. ↑ "Olivia Colman". David Tennant Does a Podcast With... अभिगमन तिथि 20 February 2018. ↑ Dempster, Sarah (18 June 2007). "Fame is quite scary". The Guardian. London. अभिगमन तिथि 17 July 2007. ↑ Brooks, Xan (24 October 2013). "Ben Whishaw and Olivia Colman cast in new film from radical Greek director". The Guardian. अभिगमन तिथि 6 January 2017. ↑ Jaafar, Ali (24 September 2015). "Emma Stone & Olivia Colman in Talks To Board Yorgos Lanthimos' 'The Favourite'". Deadline Hollywood. अभिगमन तिथि 6 January 2017. ↑ "Olivia Colman wins best actress Oscar for The Favourite". Guardian. 24 February 2019. अभिगमन तिथि 25 February 2019. ↑ Maslow, Nick (8 January 2017). "The Night Manager's Olivia Colman Wins Best Supporting Actress Golden Globe". People. अभिगमन तिथि 9 January 2017. ↑ Wiseman, Andreas (2 December 2018). "British Independent Film Awards: 'The Favourite' Wins A Record Ten Awards". Deadline Hollywood. मूल से 6 December 2018 को पुरालेखित. अभिगमन तिथि 2 December 2018. ↑ Lockyer, Daphne (4 May 2013). "Broadchurch sensation Olivia Colman: "I'm never cast as the love interest"". London. ↑ Watts, Halina (23 March 2013). "Broadchurch star Olivia Colman says she's lucky not to be a classic beauty". Daily Mirror. ↑ Hoyle, Ben (February 25, 2019). 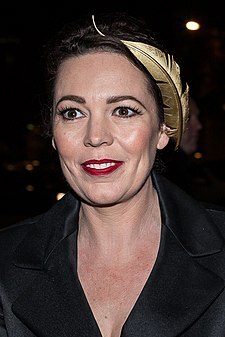 "Olivia Colman: Babysitter sent video of kids watching me win Oscar". The Times. अभिगमन तिथि 25 February 2019.